and promotes these green endeavours through the Slovenia Green brand. Read more about the Green Scheme in short overview. To obtain the Slovenia Green Destination label (Bronze/Silver/Gold), the destinations must meet the Green Destinations Standard criteria, while providers first obtain/present one of internationally recognised labels that are also verified by Slovenia Green in order to obtain Slovenia Green Accommodation/Park/Travel agency label. Slovenia offers a total of 48 destinations, 25 accommodation providers, 4 natural parks and 2 agencies, which comply with the green strategy and pride themselves on having obtained the Slovenia Green label. Find them on the interactive map and follow the green story of Slovenia on tourist pages. Spread the green idea with us. Select your green destination, green provider, visit green parks and find green agencies. 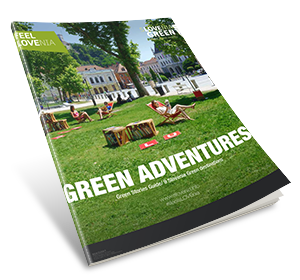 Check out the latest publications on sustainability with additional information about the green scheme and destinations and providers with the Slovenia Green label. This guide to green experiences introduces you to nine green destinations where you can spend a truly green holiday in one place.